In my last post, I compared Telok Pulai Bak Kut Teh on Jalan Teluk Pulai, and a spinoff (?) in Taman Intan, which is easily accessible from the Federal Highway. But along the row of old, somewhat dilapidated shophouses on Jalan Teluk Pulai in Klang, lies ANOTHER gem of a Bak Kut Teh outlet, simply named; Klang Lek. 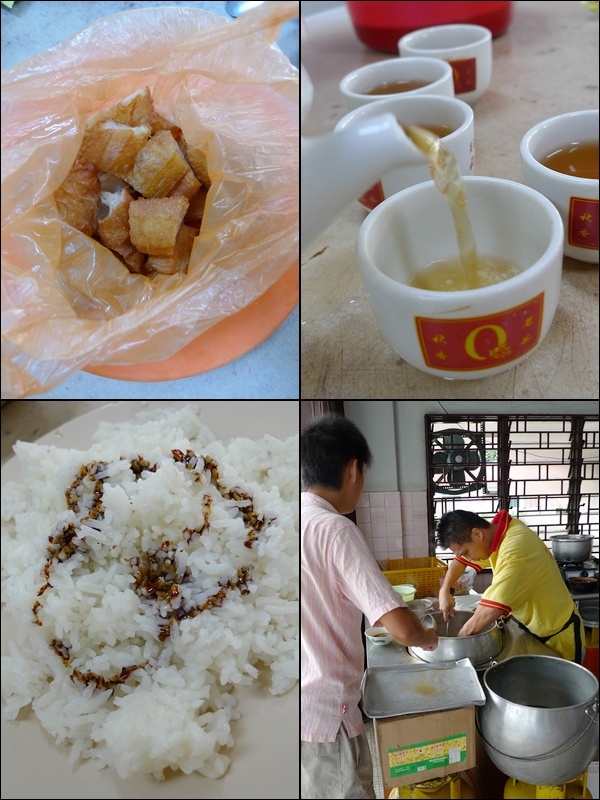 The You Tiao (fried crullers) came in a fuss-free plastic bag, typical brew your own Chinese tea, the slightly-oiled rice with the thick, dark and sweet soy sauce, and digging for treasures under the pot of black gold?! Surprisingly, this 30 years old plus shop was not as crowded nor as pretentious as the others. Simple and laidback, I felt compelled to sing praises on the sheer comfort of having my BKT fix here. No waiting for tables, no rushing to sip your cup of tea just so the family of 10 who had been eyeing your table can finally rest their steely glances, and certainly no problem with parking. This row of shop facing Jalan Teluk Pulai, is located right in front of a residential area. But don’t go parking in front of people’s gates and claimed that J2Kfm told you so. The DRY version of Bak Kut Teh – A stronger, pungent creation with a thick, almost caramelized gravy clinging onto the cuts of meat, dried chillies, ladies fingers, and dried cuttlefish. 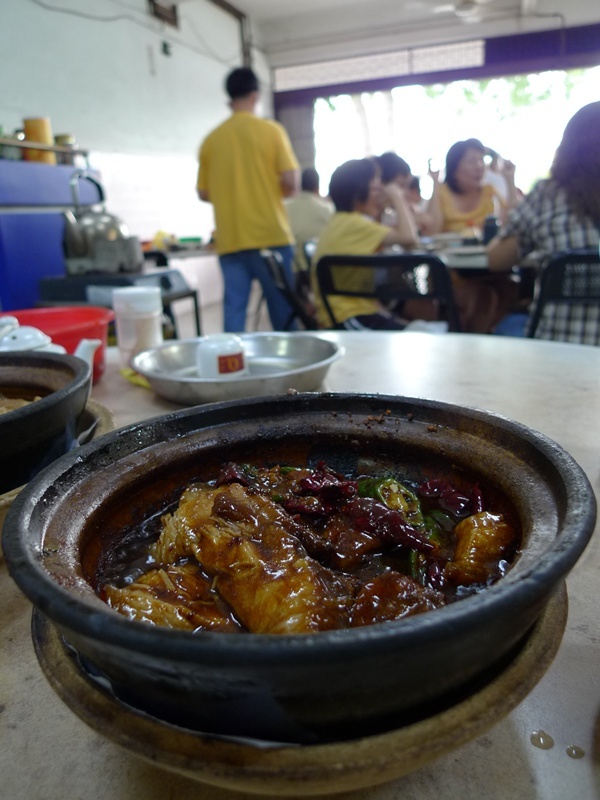 Klang Lek Bak Kut Teh serves the usual BKT in claypots, or in bowls, according to your preference. And on top of that, they serve the DRY version of Bak Kut Teh as well, in claypots no less. I’ve tasted a few dry BKT, both in Klang, Subang, and even in Ipoh. But I have to admit, Klang Lek’s interpretation of the dish was spot-on. Very strong flavours from the glistening thick gravy flavoured with herbs (much like BKT’s recipe, but continuously boiled/heated until dried up). The bits of dried cuttlefish added a decent hint of pungency, with a different texture to the dish. For those who have not tried the DRY version of BKT, just imagine any Kung Pou style of dishes, with a heavier taste. Klang Lek managed to cook up a rather delicious concoction of Bak Kut Teh as well. The soup was slightly thicker than the Teluk Pulai’s version, with generous cuts of meat, a single portion was priced at about RM8-9 (I don’t think there was a receipt issued for this meal), while the DRY version was priced at 50 cents more. So where’s your favourite haunt for good old Bak Kut Teh in Klang? Or Kuala Lumpur for that mattter?! Opening hours : 7.30am – 9.00pm. I’m surely going with the thicker bak kut teh! LOL 😀 Must be damn delicious. :p The sight of it is enough to makes me drool! the dry BKT was good, accentuated by the pungent dried cuttlefish. perfect with a portion of soupy BKT on the side. Somehow Klang adds premium to BKT. More so if situated in that royal town. 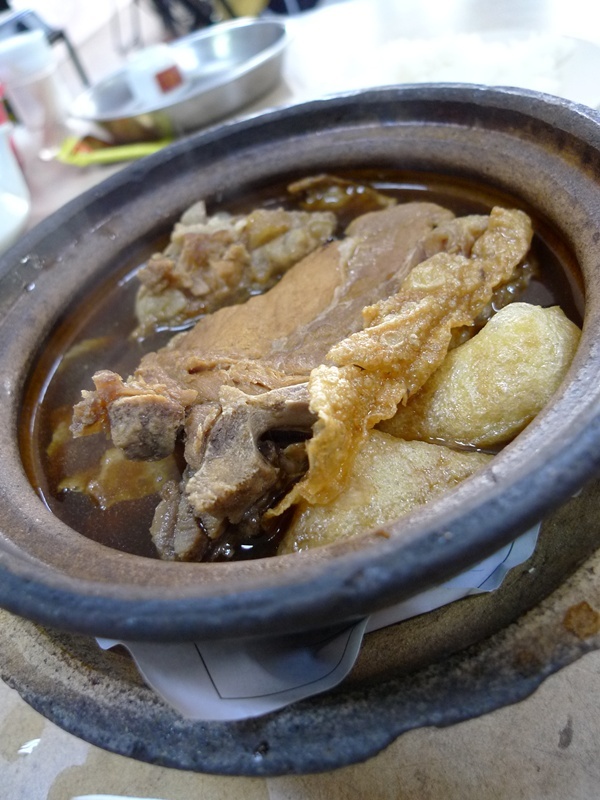 wow..this one also looks as nice… so klang memang is famous for bak kut teh!.. last time my KL bro took me to Ampang side, if i m not mistaken.. can eat the superior meat of bak kut teh… very fast sold out, according to him.. must get the name of the shop.. now i suddenly recalled back..
i’ve been there many years back, but haven’t got a chance to try the dry version, always feel like having the soup with rice…..
.-= Julian Si´s last blog ..Roast Duck and more tai-chau dishes in Abu Dhabi – Meena Cafe =-. somewhere i want to try, always. after watching all food show (the ah xian show and taiwan food show) talking bout this place. I just blogged about a place that serves dry BKT that rocks!!! check it out ok??? at the other end corner lot of this shop, there’s a shop that sells seafood bkt. Kinda originated from there. the soup is not as thick as lek’s but it’s perfect for seafood (crab and prawns usually best) ..but u have to be there early like 9am cause they usually finish by 11am.. basically that row itself, there’s 3 bkt shops.. I grew up eating bkt from the 3 shops..
the one in the middle do have assam fish and vege. but it’s more exp compared to the other 2.
another shop for BKT in klang town is behind the huge building (then known as Plaza Metro) now it’s occupied by LHDN and CIMB. it’s nnext to Maybank. it;s a corner lot single storey house (i think its called “sei ngan cai”.. they’re open at night as well) but u have to beat the massive traffic to go there.. I think I’ve tried the one near maybank, at a corner lot of a house. is the other corner of Klang Lek, the Teluk Pulai BKT? or another? I am a klangite. Yet i hv never visited any of these restaurants. Food during my growing up days was certainly much delicious. Thank you.